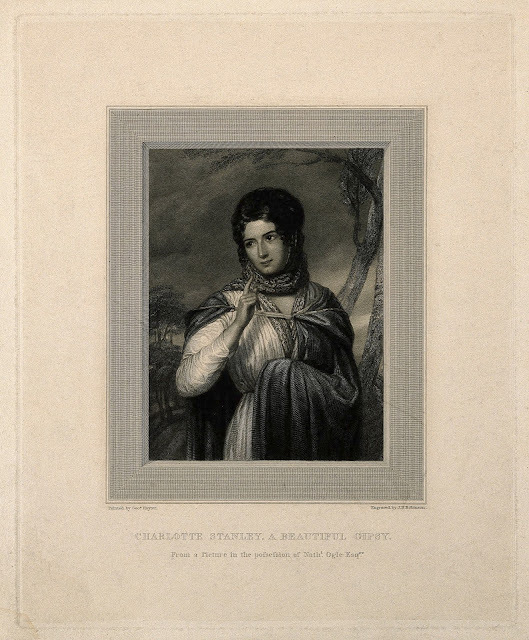 Baby books were often beautifully illustrated and contained additional features such as songs, poems and extracts from literature. 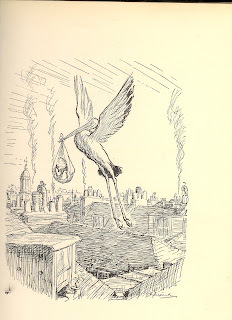 From Eva Erleigh, The Little One’s Log: Baby’s Record, Illustrated by Ernest H. Shepard. Partridge, 2nd impress, 1929. 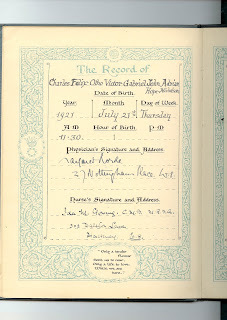 Filling in a Baby Book was primarily the task of a mother but other members of the family (including the child itself as it got older) might also have added details. The many hands at work within these books (sometimes retrospectively) may not always have been accurate, so be careful with the information you find. 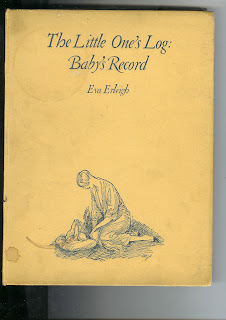 Eva Erleigh, The Little One’s Log: Baby’s Record, Illustrated by Ernest H. Shepard. Partridge, 2ndimpress, 1929. Baby books were aimed at middle and upper class mothers who had the literacy skills and the time to fill them in. The Girl’s Own Paper October 2nd 1886, Vol VIII, No 353, The Leisure Hour Office, 1886. 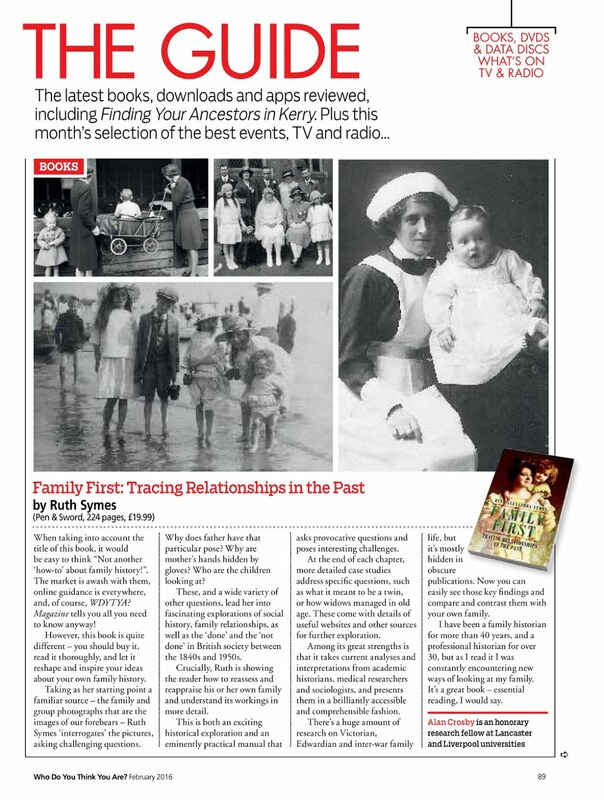 Our Victorian and early twentieth-century ancestors, it would appear, had just the same desire to make memories concrete as we do today. 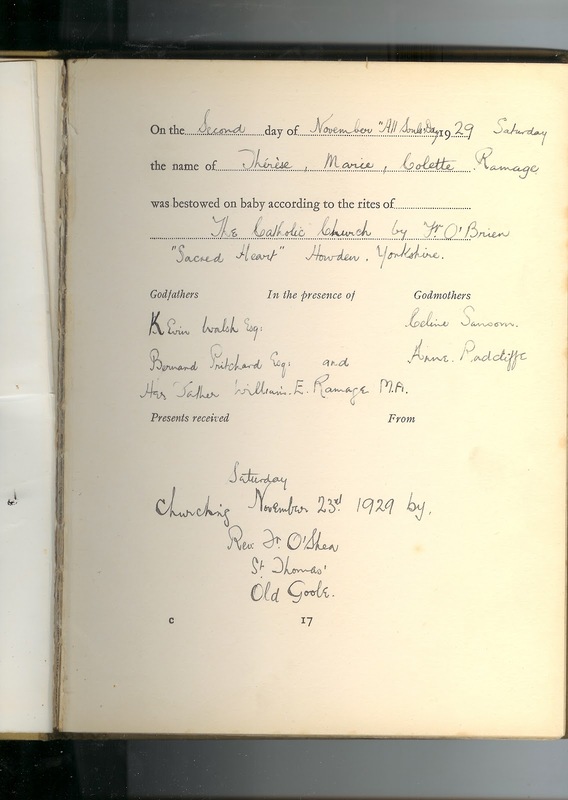 Keeping records of a baby’s early life in the form of a baby book was one of many ways in which they set out to record, categorise and organise their world. Baby books may turn up among family papers or in second-hand bookstores. Some may be advertised for sale on-line at bookstores and auction sites such as www.abe.com and www.ebay.com. 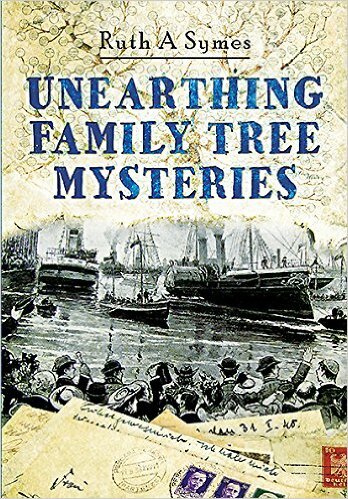 And if you are lucky enough to come across such a book that relates directly to your family, it may provide you with a great deal of useful genealogical information and a lot of pleasure along the way. Baby books first came into vogue at the end of the nineteenth century. Titles such as A. O. Kaplan’s Baby’s Biography (1891) and the Reverend Illingworth Woodhouse’s Baby’s Record: Mother’s Notes About Her Baby (1895) comprised a list of blank forms in which mothers could record the important details about their child’s first years. 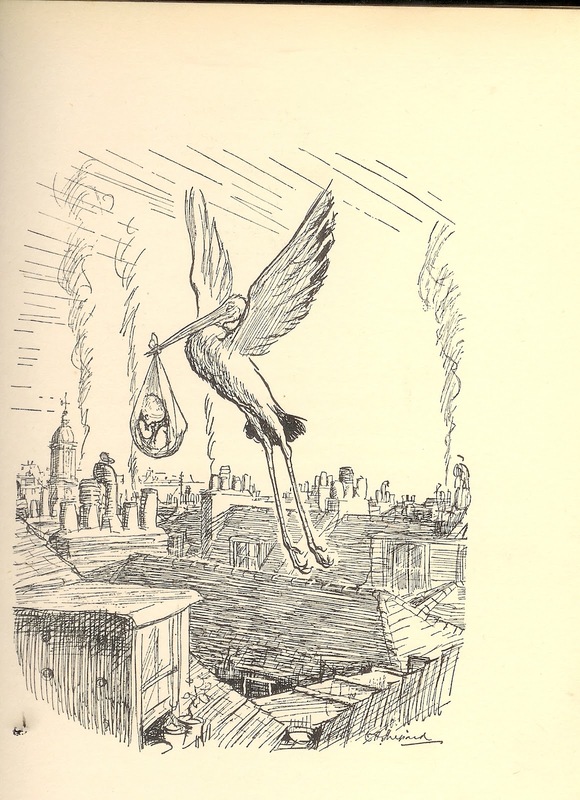 In the 1920s, a number of prominent women produced a clutch of rather more sophisticated and detailed baby books aimed mainly at the upper classes. The Jewish child welfare reformer Eva Violet Isaacs (Marchioness of Reading) came up with The Little One’s Log (1927) which was published under her penname, Eva Erleigh. 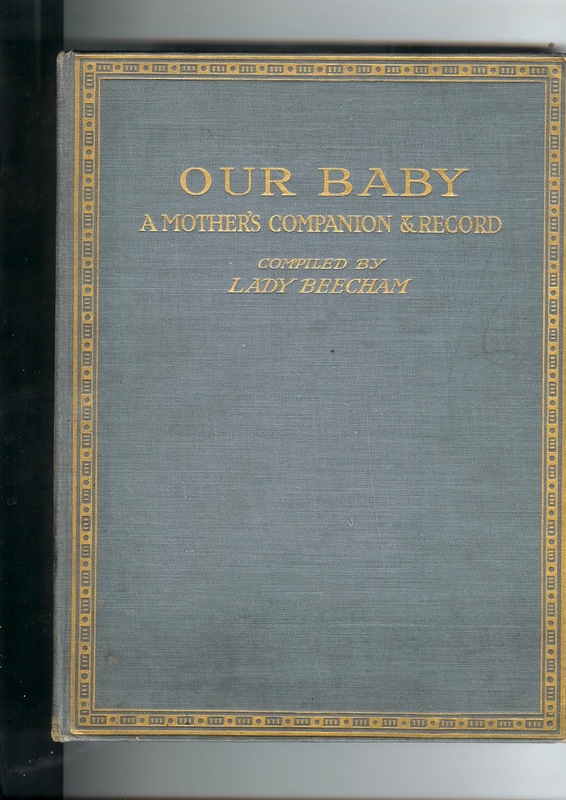 Lady Utica Beecham, the first wife of the composer Thomas Beecham (and from the same metropolitan social circle) designed Our Baby (1920). All these writers used their Baby Books as an excuse to lecture mothers on all aspects of childcare or ‘mothercraft’ as it was sometimes known. 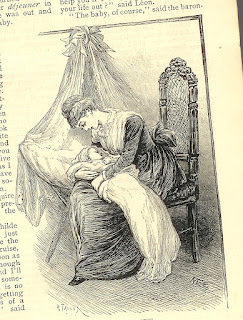 Some hoped that their book would act as a medical reference for mothers, so that if a child developed an illness later in life, the mother could look back to their babyhood to trace why and when it had begun. What’s in a Baby Book? 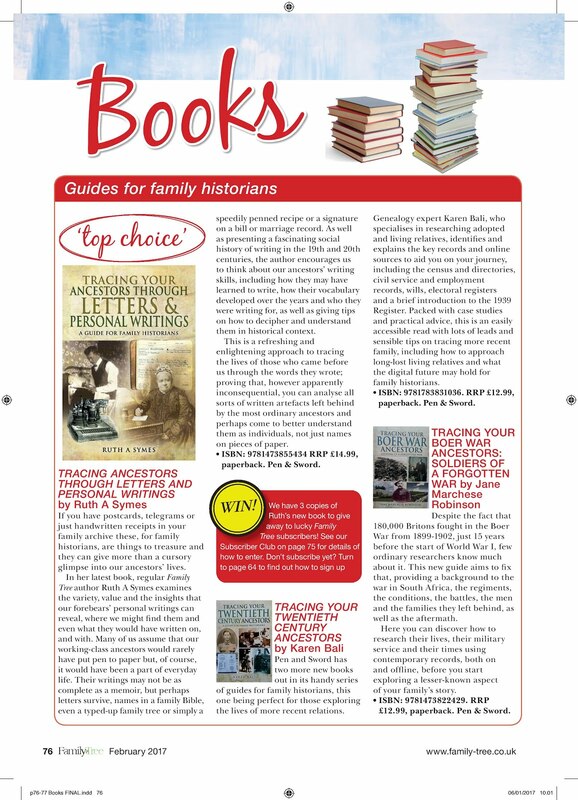 Given the fact that baby books were not primarily designed with family historians in mind, it’s surprising just how much useful genealogical information they can contain. 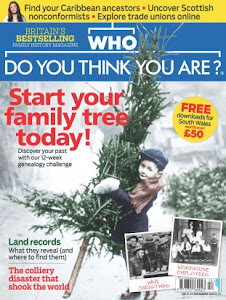 It’s relatively common, for example, to find the child’s name, the year, month and day of the week on which the child was born, the time of birth, the place of birth, father’s name, mother’s name, father’s occupation, father’s birthplace, mother’s birthplace, mother’s maiden name, names of siblings, and addresses of the family’s home or homes. 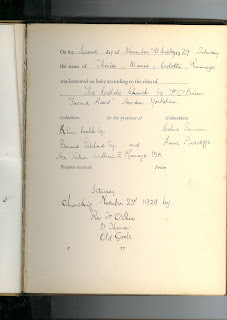 Baby books may also include the names and addresses of schools attended by the child with dates of attendance and there were often spaces for the date of Holy Confirmation, the Date of Holy Communion and the date of matrimony (assuming that the family continued to keep a record of the child’s progress into his or her adulthood. 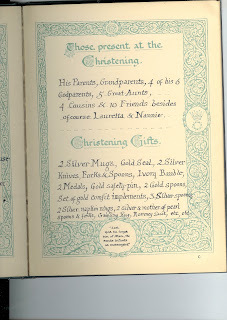 Less interesting from a genealogical point of view might be the physician’s signature and address and the nurse’s signature and address as well as details of the child’s christening including the hour, day of the week, month and year that it took place, by whom the child was christened, and the place of christening. There were also places to record dates of weaning, immunisations and hospital stays. Baby books usually provide the names of a child’s godparents. These might well have been direct relations of the child. It was common, for example, to ask grandparents to be sponsors. But even if they were not directly related, the names of godparents might help you to place a child socially. Godparents were usually chosen because of their friendship with the family, and their social and financial position was carefully considered. It was not ‘the done thing’ to choose godparents from a very much higher social rank than your own family, but on the other hand, it was certainly hoped that godparents might provide for a child - in one way or another - later in life. Baby books can also be helpful in solving the mysteries of where certain family heirlooms came from. 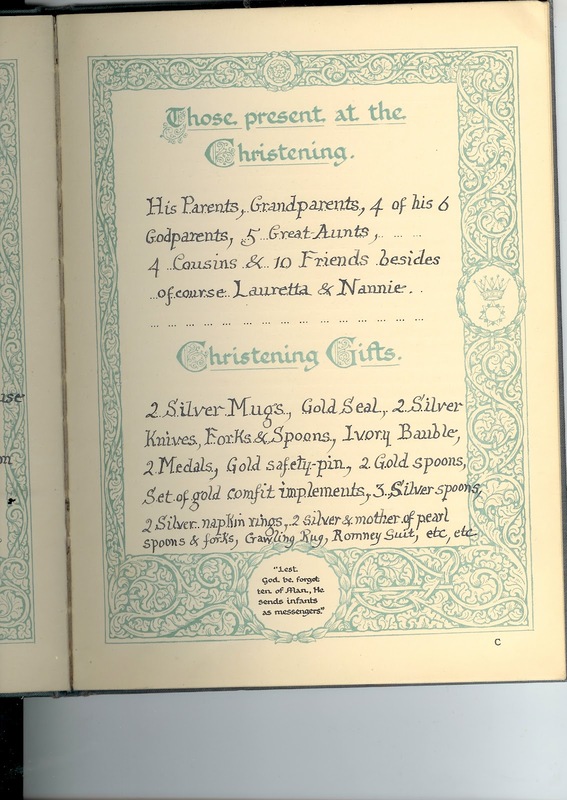 It was common to give items made of silver, coral or mother of pearl such as cups or porringers, knife-fork-and-spoon sets, basins, napkin rings and ‘comfit implements’. These are often listed in baby books next to the name (and relationship) of the person who gave them. Finally baby books allow you to flesh out your knowledge of the first years of a particular individual’s life in a way that no other record really can. Even early examples include spaces to record the dates of the baby’s first laugh, first step, first words, and ‘pretty sayings,’ his or her first illnesses and the presents he received on his first few birthdays. There may also be places in the book specifically in which to keep material reminders of the baby’s development: photographs, locks of hair and even baby teeth. Sometimes, tables provide the opportunity to keep a monthly record of the baby’s height and weight, and the appearance of teeth. Some books even have spaces for drawings of the shape of the baby’s head or tracings of his hands and feet. 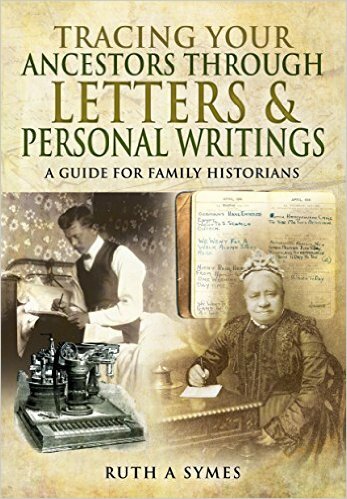 In addition, Baby Books typically contain envelopes for the storage of cards, telegrams, letters and even valentines sent to the child: all of which may include further family history clues. This particular Baby Book evidently belonged to a rather well-to-do family. 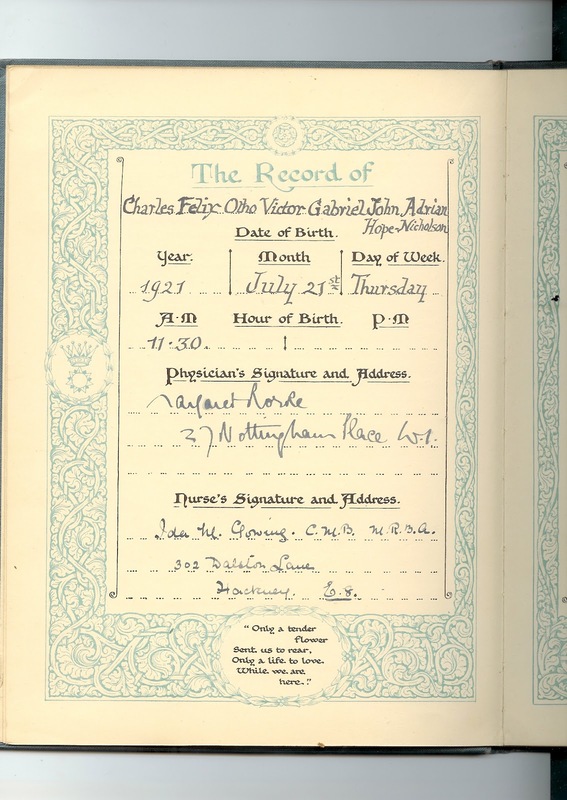 The child: ‘Charles Felix Otho Victor-Gabriel John Adrian Hope-Nicholson,’ was born on July 21st 1921 and was thankfully known to his family only as ‘Felix’. According to the details penned inside in black ink, Felix’s father, William Hedley Kenelm Hope-Nicholson, was a Barrister at Law at the Inner Temple and the family lived in Chelsea. The family were evidently prosperous and rather showy. Nowhere is this more evident than in the description of Felix’s place of birth which is described as ‘Mamma’s blue and gold bedroom at More House, 34 Tite Street, Chelsea.’ The romantic phraseology shows how Baby Books are, in some sense ‘idealised biographies’ – giving the rosy picture of the family that they wanted to present to the world. A simple search for the surname ‘Hope-Nicholson’ on Google turned up an online obituary in the Independent from February 18th 2005. 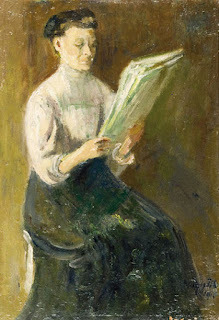 This recorded the death of Lauretta Hugo nee Hope –Nicholson (artist and wife of the painter Jean Hugo who was the grandson of the famous French novelist Victor Hugo). 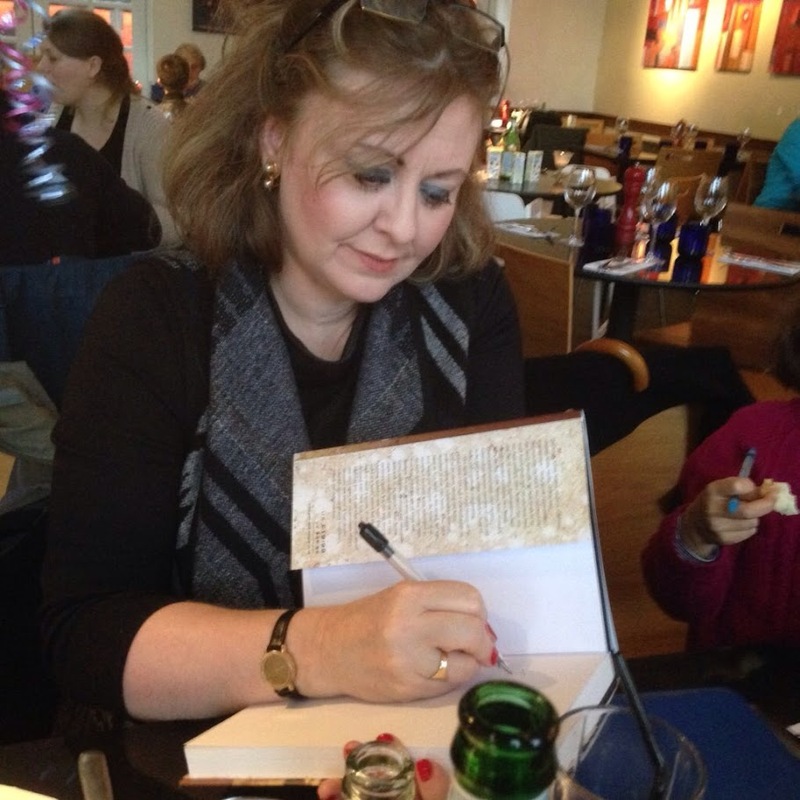 This lady is evidently the very same Lauretta recorded as having attended the christening in the Baby Book. The obituary goes on to confirm that she was Felix’s older sister. According to the obituary, the Hope-Nicholsons had a difficult childhood. Their parents separated in 1937 and whilst Felix stayed in England with his mother, the two sisters went to live in France (at Beaulieu) with their father. So much for the hectoring advice from the book’s editor Lady Beecham about the merits of a harmonious marriage! 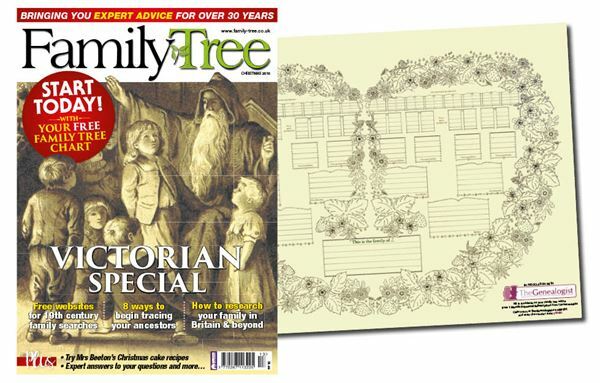 http://www.victoriana.com/victorianchildren/baptism.htm On the etiquette of Victorian births and christenings. 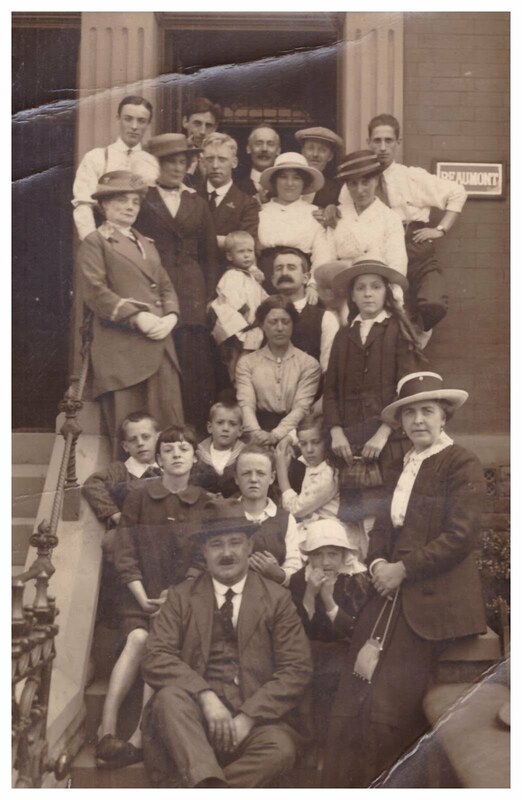 http://www.vam.ac.uk/moc/childrens_lives/edwardian_lives/edwardian_baby/index.html For more on Edwardian babyhood. www.abe.com and www.ebay.com Second-hand baby books may come up for sale here. 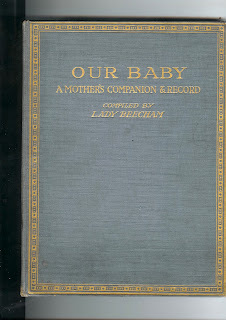 Lady Utica Beecham, Our Baby: A Mother’s Companion and Record. Leopold E. Hill, 1920. Eva Erleigh. The Little One’s Log: Baby’s Record, Partridge, 1927. 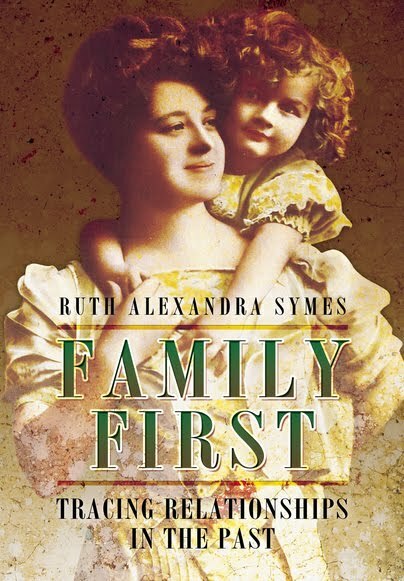 Ginger S. Frost, Victorian Childhoods, Praeger Publishers, 2008. A. J. Pierce and D. K. Pierce, Victorian and Edwardian Children from Old Photographs, Batsford, 1980.